Both the writing box and the legs for the desk are fully veneered on their faces, and in a most prominent manner. In keeping with the client’s request to make the complete piece from technology appropriate to the 18-teens I sawed and prepared all the veneers by hand. 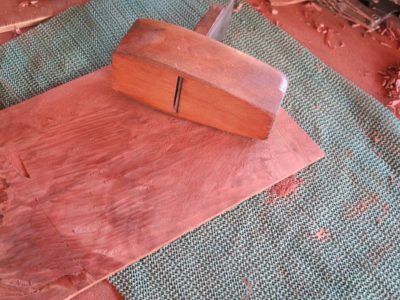 For the writing box I used a superb piece of Cuban mahogany I had been saving for nearly 40 years. I did not know back then what I was saving it for, but I knew it would be something special. 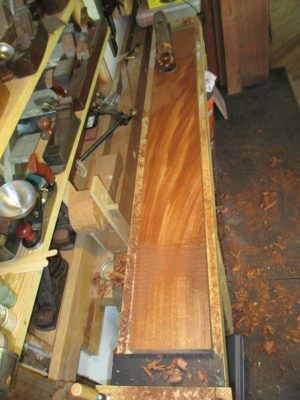 The board was just the right length and width to allow me to wrap the entire box’s full sides and back en toto and continuously, I made the back and the drawer front match which turned out nicely. 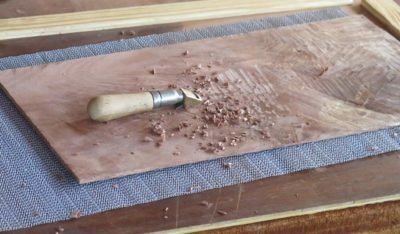 Using a variety of saws, my pal Tom and I sliced off two full leaves of veneer, about a shy 1/8″ thickness. We were not excessively experienced at the task and chose to err on the side of safely rather than efficiency. 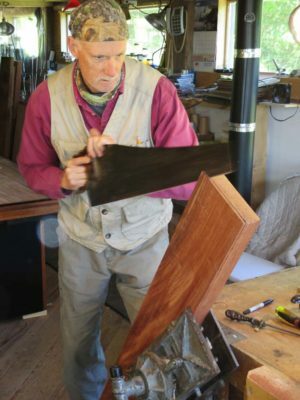 The density of the mahogany made it a real workout, but the results were definitely worth it. Sawn veneer is such a delight to work with; I have a sizable stash of sliced veneer and to tell you the truth I use it more in gluing up small pieces of plywood than anything else. Well, that and making sample boards for students to use in finishing classes. With the thick sawn veneer I can actually plane it by hand to prepare it for use. 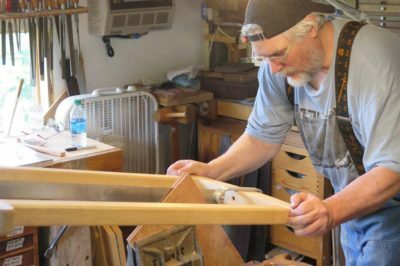 I usually concentrated on the underside, that is the side that would be glued to the substrate, hitting it quickly with a succession of the scrub plane, a fore plane, and the toothing plane. 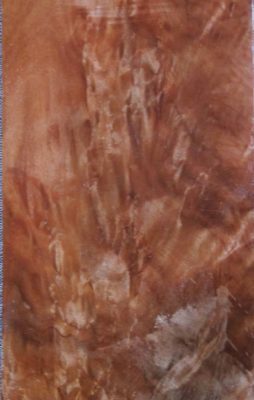 For the veneer on the legs, the central decorative fields were comprised of flame crotch mahogany. 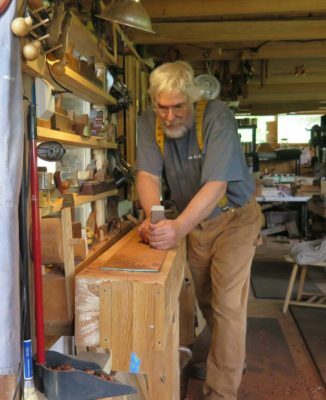 I had purchased some big 3/4″ slabs of that but they had warped so severely that dealing with it was a challenge. Even cutting them down considerably they were still a squirrely mess of end grain. I wound up sawing these almost 1/4″ then planing them flat. Now that was an exasperating adventure. 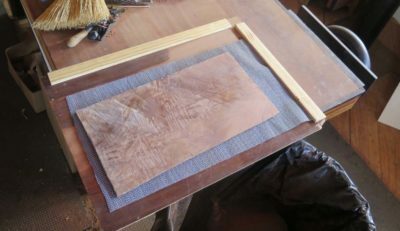 To work the pieces I made a special planing jig with thin stops on two edges, I’d put the veneer on a piece of rubber matting, push it into the corner and set to work. 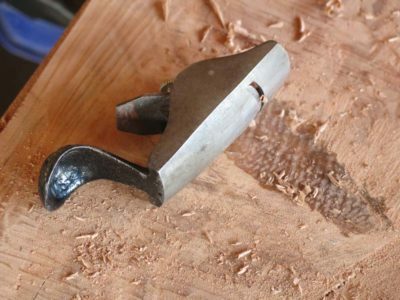 The scrub plane was too aggressive, so most of the work in flattening and thinning the stock was done with a vintage Stanley spoon bottom palm plane and some luthier’s planes, followed again by the toothing plane. The results were pleasing albeit aggravating.